Level 2 - explain how the physical environment of China lead to the advanced culture of writing tools, and advancements. 1.2 understand how language, art, music, belief systems, traditions, science, technology, values and behaviors contribute to the development and transmission of culture. 1.4 understand the role that diverse cultures and historical experiences had on the development of the world. 2.1 understand economic connections, conflicts, and interdependence. 2.2 understand the changes that occur in the nature, use, distribution, and importance of resources. 2.3 recognize the importance of technologies on economic development. 3.1 understand the importance of physical geographic features on world historic events. Level 2 - identify the significance of the "fertile crescent." 3.2 understand human geographic interactions and their impact on world historic events. 4.1 explain the development of a people�s need to belong and organize into a system of governance. 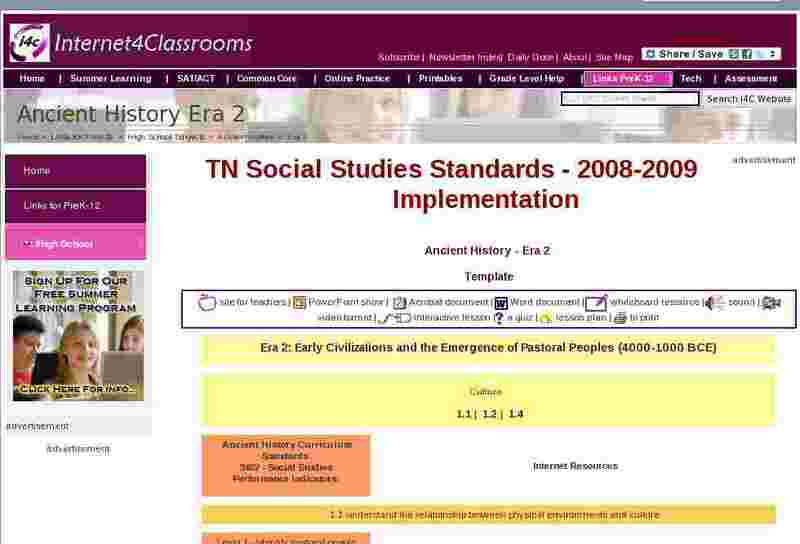 5.1 understand the chronological flow of historical eras and events in Ancient History. Level 1 - describe the interaction between early human groups, the environmental and survival methods that led to the formation of civilizations (e.g., Mesopotamia, Egypt, China, Indus Valley). 5.2 understand how historical information is collected, recorded, interpreted, transmitted, and disseminated across various historical eras. 6.1 understand the extent to which individuals, groups and institutions interact to produce continuity and change throughout world history.